Unlike many of the coastal towns in Spain, Alicante is a very “real” city – tourism is of course important to the area but the city also has a life of its own with plenty for visitors to see and do, which is far removed from the package tour type activities of nearby Benidorm. A thriving city in which the locals enjoy their own diary of fiestas throughout the year, this is the real Spain and a car is of the paramount importance to really get the most out of this superb location. Alicante Airport (El Altet) has been recently improved, upgraded and expanded by huge proportions in order to cope with the thousands of travelers passing through each and every week. This is one of the major locations for car hire in Alicante with a large selection of car hire companies to choose from including Avis, Centauro, Europcar, Goldcar Rental, Hertz, National Ateza, Record Go and Sixt Rent a Car. Benidorm – is one of the most popular holiday destinations in Europe and just a short drive from Alicante Airport – the AP7 toll road is clearly signed from Alicante Airport and will have you there in around 40 minutes. 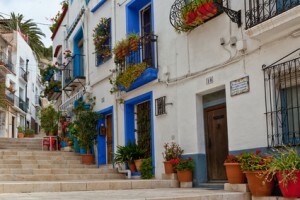 One alternative more leisurely route is the N332 which takes in the variety of coastal towns between the two taking just a little longer, especially if you stop off at one of the delightful bars and cafes along the way for a “Menu del Dia” or a drink and Tapas. Algar Waterfalls – are a little inland from Benidorm but a million miles from the hustle and bustle of the popular seaside resort. Just a 15 km drive into the mountains will lead you to these magnificent waterfalls and impressive location perfect for a picnic or just a relaxing dip in the cool mountain waters – enough to take your breath away on the hottest summer days. Santa Pola – is a beautiful Spanish resort just a 15 minute drive to the south of the airport along the N332. This charming fishing village is a real favorite with the locals with a splendid coastline of sandy beaches and rugged inlets to explore.